As I clawed my way to the end of the You Are Here festival I was approached by Glen Martin, Pecha Kucha Canberra coordinator and all-round creative powerhouse, to give a presentation about my experiences. I said yes immediately because I felt like debriefing after the festival and, well, I guess I like the sound of my own voice. (Disappointingly however I did discover that I don’t enjoy using a microphone – and so can be seen clutching it awkwardly in the image above). 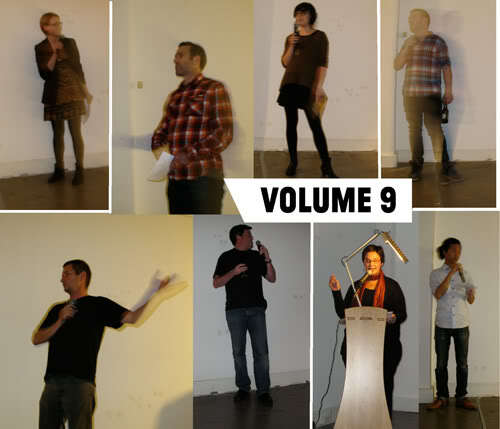 It was the 9th instalment of Pecha Kucha Canberra, and I was nestled between excellent presentations by John Griffiths, Vanessa Bertagnole, Richard Blackwell, Draw That Beast, Gilbert Riedelbauch, Marco Chan and CJ Bowerbird. For the uninitiated, Pecha Kucha is essentially a series of networking evenings – a forum for creatives (from a very broad spectrum) to share their work and ideas. Each presenter is allocated 20 slides that show for 20 seconds each. A cracking pace that keeps everyone awake and puts all speakers on a level playing field (albeit at a sprint). It’s a great experience, not only because of the wealth of connections to be made with the audience and fellow presenters, but also because although public speaking is bloody hard it’s undeniably a skill that even us mopey artistic types need to develop. Architects, Graphic Designers, Film Makers, Photographers, Fashion Designers, Web Gurus, Raconteurs, Promoters, Activists, First Year Students and seasoned professionals alike; Essentially, creatives with an interesting project/ portfolio/ manifesto to present. Remember, all presenters share the same amount of stage time. The democratic element of PK is what gives it much of its juice. In the end, it’s all about the sharing of ideas and experience. Visit the Pecha Kucha Canberra site to find out all you need.